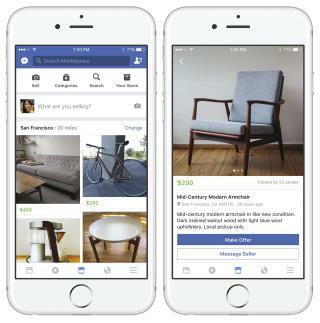 (Newser) – Today, Facebook announced a new platform-wide, local buy/sell marketplace—simply titled Marketplace. The functionality will be familiar to many users of Facebook, who may already be members of local buy/sell/trade Facebook Groups. Users can post an item for sale, specify a pickup location, and other users can bid or buy it. The two people then arrange a meeting and transfer of funds between themselves; Facebook takes no part in the actual transaction. The feature is available on Facebook's mobile app in the US, UK, Australia, and New Zealand. Facebook says the feature is coming to more countries and to desktop soon. The new iteration is only available to users 18 and older. There's plenty of hos on F*c*book already. Now they can just advertise out in the open. Love the chair, sofa, and end table depicted in the item photos. Wouldn't pay $200 for the chair. I routinely shop that product new across multiple websites for less. I'm a fan of MCM. Facebook wants to make it easier for you to meet dangerous pyschos.